I have delayed writing this post because of the issues that i had with the last write up i wrote on shippyme (if you have not read it, check here) but since I said that when I used the company again I would write an honest post on my experience I had to write this. I thought about leaving out their name because of a statement that someone from the company made on my blog insinuating that I was using the name of the company to get a lot of views on my blog. However since I had already written a previous post that had their name mentioned I decided to still mention the company’s name so as to be fair. After the first experience with shippyme was filled with troubles, I decided to give them another chance because I wanted to find out if they had improved, you all know that i am sucker for giving second chances. But before I ordered, I made sure I checked out their testimonial page on their website. Yes, people still had complaints but it seemed they were finally getting their act together so I placed my order on the shopping site I wanted to get things from. I then waited for my order to reach their office and then the ‘watching game’ began. Pros: In addition to the previous pros I stated in my other post, there were some new pros. 1. I liked the added service of sending a picture of the items that was ordered and had arrived at their office. 2. I liked that they actually stayed true to the 5-12 working days period that they claimed that the goods would arrive. I was a bit anxious at one time when I thought it was 5-12 days that they stated until I saw that it was ‘working days’ not days. So that means weekends were exempted. I was lucky that there was no problem at the customs when my goods were being transported. 3. I paid into their bank account and later that day I was unable to access my account on their website to upload the teller number. When I was eventually able to open my account, I saw that the amount I paid had already reflected. I was pleasantly surprised. Another surprise was that even though when filling the teller, I wrote my name without the booking number (that was how I had written for the previous orders), the money still reflected in my account.. And oh, when stating the account number they put the right name of the bank account saving me the stress of confirming at the counter. 4. I also liked that this time I didn’t have to disturb them with calls. Though I had to send some mails when they seemed not to have acknowledged the receipt of my items at their U.S office and when I felt the shipping weight I was giving was way above what the U.S shipping company gave. But I got to understand the way shipping weight for international packages are calculated (it has been a while I have ordered something from the U.S so I had forgotten about the calculation). 5. I also like the fact that I was not over-billed or billed twice this time. Cons: Unlike my previous posts, I have just one. Basically the con is based on my last experience. 1. The last time I used this company, I made mention of the fact that I was billed twice for some item. I don’t know if they have acknowledged that in their system. However when viewing my account page, I see that the total amount I have to pay is in red and in minus (-3100 naira). I don’t know if that means they have finally credited my account with the money they owed me or that means that I have that outstanding amount to pay. I sent a mail asking about it but I am yet to get a response. But right now I am just happy that I have received my package. 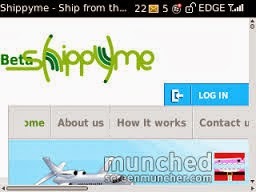 So there you have it guys, a recap of my second experience with shippyme company. I can tell you that I am really pleased with their services this time. If I was to rate them on this experience, I would rate them 4.5 stars out of 5 but because of the way I was treated the last time because of my post, I would just give them a 3 out of 5. I feel since I was saying what I had experienced during my first try with them, I shouldn’t have been boarded with all that attitude. At least now that i have said that they are better, you my readers know that that is the truth and that i am not biased. Now, the question is ‘would I recommend them to anybody’? I would not answer that question. Why you might ask? The last time I wrote my honest opinion in the last post to that question, I was accused by the same person that gave me attitude for trying to mislead my readers. So I would plead a 5th in answering. But I would say that since I have been 'eyeing' a tablet and I am itching to get my hands on the 2nd series of my beloved superman and also knowing that black Friday (29th November) is coming up (if you don’t know what black Friday is, please google it), I would be ordering again very soon and using their services soon. Hopefully I would get a major discount on the tablet(I am praying that I am lucky enough to get the tablet at half the normal price). That is all for today folks. Hope you loved reading today’s post. And I am seriously hoping I don’t receive any call or attitude from anybody for this cos the way I am feeling right now, I might blow up like fireworks. Yep, this girl is crazy like that and those who know me know that…..lol. Disclaimer: I am not an employee of the above named company neither was i paid to state what has been said. I used my own money to order my products and any opinion stated in this post are mine alone and you are free to decide what you feel about the company. Do you by any chance think that they gave your order special treatment since you had already given them a bad review? Why that statement? Have you had any problem with them lately? I know recently i have been bombarded with apology mails so i guessed they might be having some problems. I have not used them since last year december and have no intention of using them for the next 6 months. I would love to find out what the matter is. I also got some apology emails, I believe they had an issue with overwhelming increase in customers. They've since stabilized and delivery times are now back to normal which is between 5 - 12 working days. They are still my preferred shippers of choice. Let me say I am a trouble seeker....lol. After reading your first post about these guys, I decided to investigate as well as test them, with the intent to drag them through the road of my wahala. I tested, and they delivered promptly without any issues at all. My major point of interest in their service include, the user friendliness of the website, and the steady email updates. I was upset though when they sent me my bill, but when I called their office and sought for clarification, I got to understand I could have got a cheaper bill as I ignored certain handling options. But all the same, they passed and I am currently processing a major shipment with them. I agree. I'm glad a Nigerian company has the courage to step into this arena. I truly believe that they will go far with this. They provide a needed service in a timely manner and at affordable rates. They have my support and recommendation. To me i don't see and i haven't see any good thing in shippy me, i have some phones with them and it has been delivered two weeks ago, i paid for the shipment after a week of delivery to their address, after some days, i was asked to provide my international passport or drivers license of which it is not known to me initially, i use to clear my goods with my voters card or at times with my school id here in offa, but i was asked to scan and send it through email to them, i am not happy at all because i am using their service for the first time and i dont think i will use them again because of their stupid attitude. They need to let people know the requirements not at die minute, i am a student just trying to make a living through the little profits i get from the goods i get for my customers, Shippy me is annoying me. I am sorry for your disappointment. I have not used them since last year and when i used them i never sent them my i.d card. I only had to present my i.d card when collecting my goods from ABC transport company which i already knew would be asked. Maybe they have had an issue with identity theft for one of their shipment. Thank you so much, Petite Diva for your very honest post. I'm a blogger and I've been trying to find a safe way to get things shipped to me. If the Shippyme personnels have that attitude just chalk it done to the known poor customer service that Nigerians are notorious for. I think I just might patronize them nonetheless. Will be sure to blog about it too. This is all lies. Their service is very poor and all is positive reviews are ghost and paid reviews. That is disappointing to know. If they have not been effectively able to run the first operation, why open another one?